A unique collectible old Mastic-Amber handmade komboloi created with 25+2 old Mastic-Amber beads in barrel shape of 12x15mm diameter, 38cm total length, 30cm + 8cm natural silk tassel, and 46g total weight. Excelled collectible Komboloi with very old Antique black Mastic-Amber with warm touch and awesome beads sound. Black and Dark Green Mastic beads are very rare and hard to find in our Days. Mastic-Amber, old mixture of Amber and Bakelite. This is a mixture of amber with Bakelite using a method based on Bakelite, unknown today. The authentic mastics are identical to amber and you cannot tell the difference easily. The colors and the shades of the mastics are the same as the authentic amber. 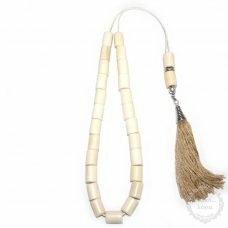 The name comes from the Arabic word "MISTECA", which means "mastic", since the smell of the beads being played and touched-therefore warmed-reminded that of mastic itself. The last authentic mastics were created around 1930-1950, time when the know-how was lost. Mastics are still created today, but as we can understand, the title is only used euphemistically since they have nothing to do with the original method: no amber is used in the mixture but various resins, and especially Bakelite.